Glas-Col was established as a provider of novel heating mantles for industrial and laboratory glassware, offering a solution to long-established challenges for a variety of heating systems. Our success was founded on the performance of our mantles for spherical distillation flasks, glass and steel beakers, funnels, evaporating dishes, and many more. In the decades since, numerous industries have adopted electrical heating systems as opposed to open flames, benefiting from improved thermal uniformity and exceptionally improved safety standards across the board. This blog post will explore five specialized mantles for heating systems that are available from Glas-Col.
Our heating mantles cover two overarching product lines: aluminum housed; and fabric mantles for more sensitive heating systems. The former supplies a rigid housing for improved durability, with a textile interior providing dampening to vibrations and reducing the risk of mechanical failure due to solid-surface contact. This also softens the transition between sharp thermal gradients to mitigate thermal shock. Our aluminum mantle heating systems are available for internal operating temperatures of up to 600°C and can be custom designed for specific glassware. Glas-Col’s fabric mantle heating systems boast a limited worktop footprint for space-saving thermal processing of samples up to internal operating temperatures of 400°C. They offer enhanced resistivity to thermal shock and can be similarly tailored for specific applications. 1. 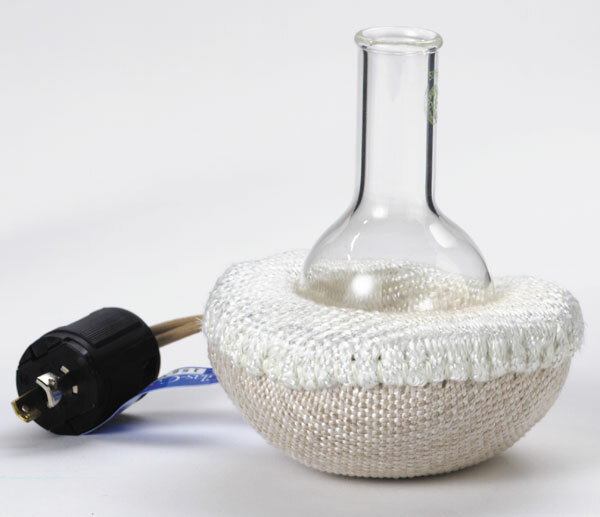 Erlenmeyer Fabric Mantles: comprising a padded textile barrier for flat-bottomed conical flasks across a broad capacity range of 50 – 6,000 mL. 2. Fabric Micro Mantles: a novel heating system for low volume thermal processing with a concave suitable for housing spherical and pear-shaped flasks with capacities of 5 – 250 mL. 3. Series TM Stir Mantle: an innovative aluminum-housed heating mantle with motorized stirring capacities for enhanced thermodynamic agitation of samples. Our heated stir mantles are available with Electromagnetic and Motor Driven stirring capacities and temperature capacities up to 400°C. 4. Series TM Can Mantles: combining the high-performance capacities of the established Series TM heating systems with expanded volumetric capacities for industrial applications. This flat-bottomed mantle can house cans and drums of up to 5 gallons. 5. Series TM Combo Mantles: a unique, low-profile aluminum heating system for extracting, refluxing, and distilling processes. It is highly resistant to corrosive media and is available in two configurations, with capacity for 1,000 mL flasks and maximum operating temperatures of 600°C. This is a small selection of the heating systems available from Glas-Col, each of which can be further customized to suit specific applications or unique facility requirements. These innovative mantles have been successfully employed in a range of industrial and academic applications, including: short-path distillation of cannabidiol; homogenization of industrial paints and pigments; quality assurance in petrochemical facilities; and much more. If you would like any more information about the heating systems available from Glas-Col, please do not hesitate to contact us.